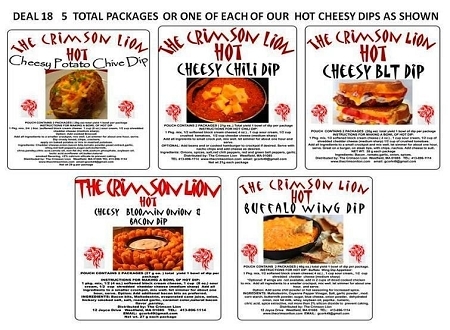 5 great hot dip flavors deal!! This is our hot dips deal. Receive (5) total pouches each flavor of our hot dips. There are 2 packages of dips per stand up pouch or 10 total dips included with this deal. FLAVORS: * Bloomin Onion & Bacon Dip * Cheesy Potato & Chive Dip * Cheesy BLT Dip * Cheesy Chili Dip * Buffalo Wing Dip. Add shipping cost.